I’ve decided that I would post steam-related goodness to my blog. While I am disappointed that Steampunk is now mainstream, it does mean there are more talented artists out there making amazing things. Take for example, this new phone. 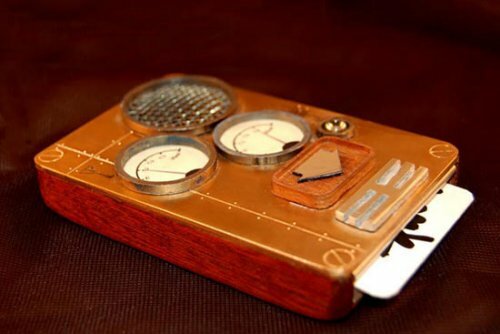 It works with punch cards that one uses to store phone numbers or commands for the alarm, etc. Even more amazing, though, is Lord Cockswain’s Ray Blunderbuss, The Unnatural Selector. 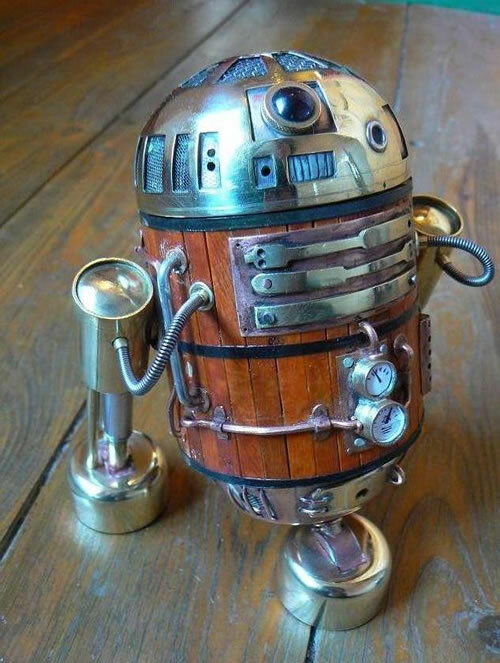 Finally, while I normally have not been thrilled with Steampunk renditions of Star Wars characters, I find this little beer barrel R2D2 to be the exception. Early this morning, I joined Chad and his visiting family to watch the Macy’s Thanksgiving Day Parade (Paul and Damien didn’t drag themselves out of bed). It was quite chilly from the wind, but it was worth it to watch such an iconic event. I didn’t know most of the stars on floats, but I did see Idina Mendez and Kristen Chenoweth, “witch” was awesome. Andy Williams was not on his float, and later we heard he was just performing, so we were a little bummed about that. Later we went to the Brick Café for an early dinner. It was very good, and I didn’t stuff myself into sickness. The restaurant is very cute; with all the brick, it reminds me of Milwaukee. I have updated my photos, so you can take a peek. Partway through the parade, my both sets of batteries died, and I had to switch to my phone camera. I will try to get better pics from Chad. As for non-holiday-related stuff, I had been offered a job in the Financial Aid dept at school. But, it was 20 hours/week and did not offer health benefits. And so I doubt I can take that job. However, I am also applying for a Graduate Assistant position (like a Teaching Assistant with fewer responsibilities), which *does* offer health benefits with fewer hours and better pay. I’m crossing my fingers for this. I decided that I would post several of my favorite bits of medieal humour. You may have seen these, but you may not. I haven’t had much to write about since my birthday. Last week was a regular week, four classes in three days, and five days of Starbucks. Friday, we went to see the new Bond; it wasok but nothing to write home about. Still, Daniel Craig is an awesome Bond; the writers/director/etc need to work it out a better. Saturday I proctored and tried to work, but ended up cramming my head full of romantic comedies. Sunday, I did homework and went out to dinner with neighborhood historians Chad, Tracey, and Anton. This week has been pretty intense. Monday night I was supposed to be the discussion lead for an article, but my paleo prof changed the syllabus without announcing it; she just made the changes on the website. I had already started prepping before she made the changes, so I contacted her and she asked me to do something else. Plus, we were doing cursive hands, and it was so difficult for me to work through it on my own, that I didn’t get very far. I emailed the prof to let her know that. When I got to class, we didn’t even get around to the replacement discussion she had me prepare. *And* she collected to homework, which she’s only done one other time and only after giving us notice. And she knew I wasn’t done. Le sigh. Tuesday, I had to present on a few readings in seminar, and then we had some fun in Latin reading a weird play. Tomorrow, I work 8a-11a. But then I have to go back to work from 6p-8p for holiday training. So I’m hoping to cram in a lot of random homework since I’m “stranded” in Manhattan. My friend Chad invited me and our friend Paul to go with him and his family to watch the Macy’s parade Thanksgiving and then have dinner at a neighborhood restaurant rumored to be excellent. If that let’s up early, I might head over to my friend Rob’s place, who also invited me for TG dinner. But I work Black Friday. Should be pretty slow, though, since most of our regulars won’t be working and we are about six Starbucks away (three blocks) from the nearest shopping hotspot (Macy’s Herald Square). That’s it for now. I’m gonna chill for a half hour and try to not fall asleep so I’m not groggy in class. There is so much more; this is but a sampling. I had off on Friday and so stayed up late Thursday watching movies. Friday, instead of going to Michaels for cake decorating stuff and getting some lunch, I dawdled until the last minute and had to rush to a 2pm meeting. After the meeting, I got something small to eat, knowing I would be having pizza at 6pm. Then I tried to do some homework, but was unmotivated. At about 5:30, the medieval studies folks met in the closet that is our library to watch Tristan & Isolde and have pizza and beer. I wish I had a photo, because it was rather funny to see us squeezed in there in the dark surrounded by books with a mountain of munchies on the table. After the movie, Chad, Jenn and I took our time heading over to Indigo for karaoke. Several other folks met us there. We three medievalists sang “Living on a Prayer” and Jenn & I sang “Girls Just Want To Have Fun.” I’m not very good at it. I don’t like to sing loud, and you can’t be heard unless you yell the songs or are a powerhouse singer. Afterward we hit a diner, but I didn’t need more food so I had pie. Got home about 3:30am. Things go late in a town when bartime is 4am or later. Saturday, I slept in until 1pm. Eep. I didn’t get any homework done, but watched movies until dinnertime, when I picked up some Pad Thai. It was quite bad. Then, I received a text that Paul and Chad were going to see Role Models, so I met up with them. It was quite funny. I would recommend it to my friends who read this blog. On the way back from the movie, I picked up some Cold Stone, to make up for the Thai, and some cut flowers. I watched some more films while doing prepatory research (finding sources and such). This morning, I actually finished my paleography before noon. Then I cleaned the bathroom, started laundry, and began to paint the spackle spots on my walls. I want to do my Latin now while the next load of laundry is going. I’ll need to be more cautious now of going out. It’s expensive. I must stick to my oatmeal and carrot diet; it’s cheap. I’ve had cupcakes on the brain and off for a couple weeks. It first started when I noticed a friend on Facebook had posted images of Milwaukee’s Iron Cupcake Challenge. Then I made cupcakes for medieval movie night/my birthday. Then I found out another medievalist and friend has a sister who is a baker of cupcakes. And so, I wanted to post these cupcake links. I like to bake crafty treats. I think I should do it more often. I never did get around to decorating my cupcakes on Friday, but I had some fun ideas that I will have to try in the future. Today at work, Starbucks was giving away a free cup of coffee to anyone who had voted. We stayed rather busy. After work, I had two classes today, which went fairly well. Gettng out of school about 6:30pm, I stopped for a burrito on my way to an old friend’s place for an election party. Since he lives in Brooklyn and I don’t know the are, my subway ride took longer than expected (I waited for a train that wasn’t running). Anyway, I arrived about 8:30. It was great to see Rob again. I went to Emerson with him, and the last time I saw him was at another college friend’s wedding, perhaps 1999 or 2000. Right now, he works for CityCorp (I think) and is co-founder of a children’s theatre company. It was fun to meet new folks, particularly folks in their 30s. It was more natural than 20-somethings getting wasted and trying to hook up. The election, as you all know, was super exciting. When 11pm hit and the west coast went blue, the entire city went ape. Honking, noise makers, cheering, chanting, people in the streets. In the subway, people were cheering at every stop. We went up on the roof and saw the red and blue sliders across the way in Manhattan. At 11:15, we watched the McCains speech, and then went down into the flood of people in the street. At midnight, we settled in to watch Obama’s speech, and there were tears and applause in the apartment. We knew people all over were listening, because we’d hear honking after poignant remarks. A short while after the speech, I decided I had better head back to Queens to get some sleep. Upon returning home, I found in the mail my absentee ballot from Milwaukee. So, back in September, I applied for my absentee ballot using Chris’s address as my home address. The town of Brown Deer contacted me to say I wasn’t registered there and that I would have to apply for a ballot in Milwaukee using my old address in Bayview. I did. Milwaukee never sent me a ballot. I looked into voting in NYC, but all the information I found online said you had to register a month in advance. I called the voter hotline, but every time I was put on hold (it’s perfectly fair that they take calls in order that they are received) but then after 10 minutes or so, there would be a message that there are too many calls, and I’d get cut off. Why make people wait to be cut off? You are currently browsing the RaggedyAndroid blog archives for November, 2008.